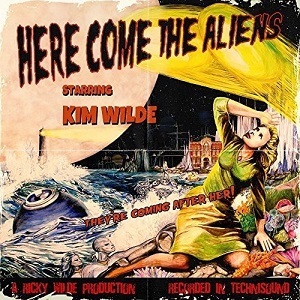 80's pop legend Kim Wilde releases her new album on 16th March - "Here come the aliens". Kim Wilde fans of a nervous disposition will probably breathe a sigh of relief that it's aliens, not Lawnmower Deth (with who she released a Christmas single at the end of 2017). While most 80s pop stars retired and have subsequently made comebacks, Kim Wilde never really went away - she may have been less in the limelight than in the past, but she's been steadily releasing albums and touring around the world. This is her first album for a fair while to be released in the UK that is new material rather than covers. I must admit that while I'm familiar with her music from the 80s and early 90s, I hadn't listened to anything she's done since then until her collaboration with Lawnmower Deth, so I was looking forwad to listening to this new album to hear how her new material sounds. Well the first thing that's obvious is that Kim Wilde still has a fantastic voice, whether it's on the more upbeat pop songs or the softer songs such as "Solstice". The album was produced by her brother Ricky Wilde, and on the first single, "Pop don't stop" he duets with her - the first time they've duetted on a record. There's a real mix on this album, from the great pop songs to the slower ballad styles and rock. "Rock the Paradiso" is as the name suggests, more rock than pop, and refers to the famous Paradiso venue in Amsterdam. "Cyber nation war" shows Kim is certainly not stuck in the past as she sings about the problem of internet trolls. It's a great song. The album artwork is brilliant - done in the style of a 50's scifi B-movie poster. It's been created by her niece, Scarlett who when not working as an artist sings on stage with Kim Wilde and her band. She's also been involved in writing the songs on this album along with Kim and Ricky - a real family effort. I'd hoped this would be a good album, but it's not just good, it's a lot better than I could have hoped for. Kim's voice is still fantastic and the songs on this album are really top notch. It's a fantastic album all round - I've already ordered my copy.